Look for firm, heavy chestnuts with dark shiny shells. Over 100 varieties of chestnut trees exist, many of which produce clusters of nuts while others produce single chestnuts. The cultivated varieties of chestnut tree that produce single large nuts are thought to be more flavorful and better for cooking. 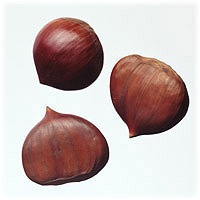 This variety is known in France as marrons, while the smaller, ordinary chestnuts are called chataignes. An inedible variety of chestnut is known as the horse chestnut. Chestnuts are related to the beechnut and the chinkapin, a nut long eaten by Native Americans.